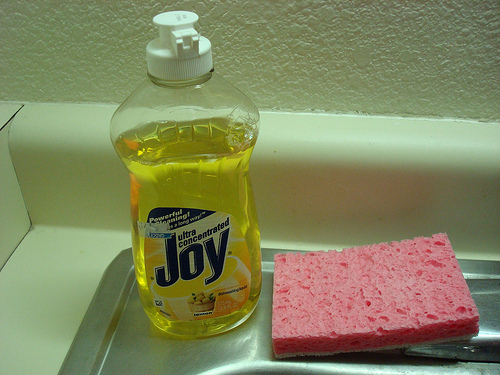 Mom meant Joy the dish soap. The dishes needed to be done, and she wanted her team to dig in – to grab the bottle of Joy and start washing and drying. But when we think about biblical joy instead of dish soap, this line becomes a wonderful image for us on this Sunday after Christmas. Let’s get the joy, and get to work. 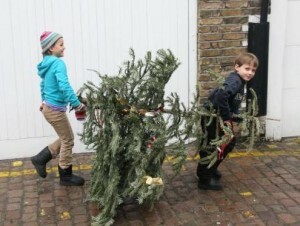 When Christmas is over, there is always a lot of work to do. It begins Christmas morning after all the presents have been unwrapped, someone needs to pick up the paper and boxes and get them to the recycling bin. Later the dishes from Christmas dinner need to be washed. Soon the tree needs to come down, and be either disassembled or driven to the head of the Santa Fe Trail to be mulched. The ornaments need to go back in their boxes and the decorations out in the yard need to be brought in. Even the nativity scene we set up so nicely in the living room, will need to have each of its figurines put back into its proper slot in the styrofoam. Friday morning at the church the folding chairs that were filled for the 7pm Christmas Eve service were taken down, and the Great Room furniture returned to its proper place. The candles were disassembled and put into storage with the leftover glow sticks. We began to put things back in order for our worship today, back to the way they normally are. Many of us will be soon be returning our Christmas boxes to the crawl space, attic, or garage where they will wait 11 months or so, until we bring them out to celebrate Christmas 2014. We place the red and green storage bins among others filled with things we have saved over the years – old cards and letters, photographs and video tapes, memories of parents, grandparents, weddings, vacations, celebrations, and things belonging to our children when they were small. I don’t know about yours, but our storage area contains several Rubbermaid tubs labeled “Keepsakes.” They are, as a songwriter put it, “lifetimes of boxes” filled with memories we don’t often look at, but just love to know we still have. Thurman, of course, didn’t just make up this list of work he calls “The Work of Christmas.” He is paraphrasing the words Jesus read in this morning’s Gospel lesson, penned by the prophet Isaiah, our Old Testament lesson. Isaiah originally wrote these words to the people of Israel who are experiencing a post-celebration letdown. They had recently returned home after years of exile in Babylon. It was a grand and glorious day for which they had been praying for a long time. Some had wondered if it was ever going to happen – and it had finally come. They had been ecstatic. But after the celebration, reality began to sink it. They hadn’t returned to the place they remembered. Their beloved homeland has been devastated. 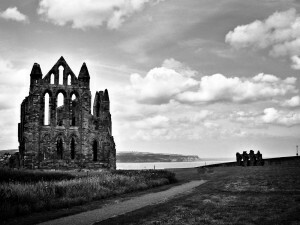 Even their once grand Temple was in ruins. Everything was a mess. The joy of returning home was quickly replaced with despair as they looked around at the overwhelming work of rebuilding ahead of them. As I think of the ancient Israelites returning from exile, I cannot help but also think of our friends in Black Forest returning home after weeks of evacuation this summer, to find the devastation to their homes and neighborhoods. I also think of our neighbors in Loveland, who after being evacuated by the rising waters, were allowed to return to their homes, many of them finding everything they knew washed away or buried in mud. This summer many lost their precious heirlooms to fire or flood. It is for these people Isaiah receives words of hope. Standing among the ruins, addressing those who have lost so much, Isaiah speaks the word of God to the people, “he has sent me to bring good news to the oppressed, …to proclaim the year of the Lord’s favor, …to comfort all who mourn, … to give them a garland instead of ashes, the oil of gladness instead of mourning,… They shall build up the ancient ruins, they shall raise up the former devastations; they shall repair the ruined cities, the devastations of many generations.” (Isaiah 61:1-4). It must have sounded odd to hear about a year of favor, to listen to Isaiah speak of good news, comfort, garland, and oil of gladness while looking upon what had been done to them, looking at the cleanup that needed to be done. Isaiah’s words were an encouragement to a people who could have wallowed in defeat. It is a call for the people to get the joy and get to work. As Jesus says those shocking words, “Today this scripture has been fulfilled in your hearing,” he too is standing among ruins – a people who identified themselves as chosen by God but are oppressed and occupied. Many of them are deeply poor, with little hope of things getting better under the thumb of the Roman Empire. Many wondered, even some 600 years after returning from Babylon, if the exile had ever truly ended. It is no wonder why, after this sermon, the people ask one another who this guy thinks he is, and are ready to throw him off a cliff. In the midst of overwhelming circumstances, Jesus says he has come to rebuild, renew, restore, and he calls the people to get the joy and get to work. He calls us to join him in this work, which is still so desperately needed. When is it too much to fix? This is a question I would guess many of us have pondered at some point. Several months ago our car got to that point. It was too much to fix, so we junked it and got another one. The appliances in our homes sometimes break down and rather than fixing them, we find ourselves at Sears looking for a new washer and dryer. In our disposable society this young woman wonders when God will decide she is simply beyond repair. That had to be the question rolling around in the minds of the Israelites to whom Isaiah is speaking, and of those to whom Jesus preaches some 600 years later. Has God given up on us and moved on? Is it too much to fix? The first sentence of my response was one word: Never. It is never too much to fix. The story of the Bible reveals this to us repeatedly. God is on a mission to redeem the whole world, to restore things to what they were intended to be. God is in the business of saving, not disposing. There is no situation beyond God’s ability to restore, renew, redeem. It is to this task of rebuilding the ruins to which God called the people through Isaiah, and to which Jesus calls us. To reach out to the broken, poor, lonely, and hurting. 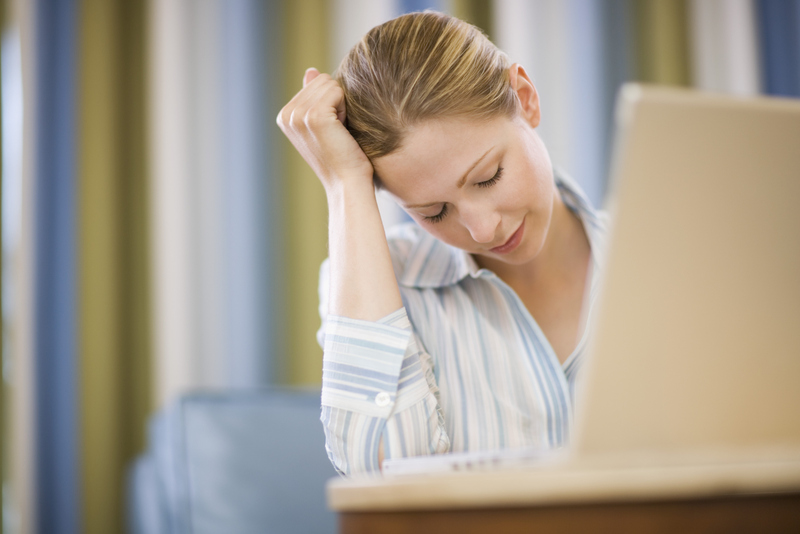 The task before us may seem overwhelming, but it is possible with God. Let’s get the joy and get to work. If you have been on social media in the last month or so, you have probably seen this picture. 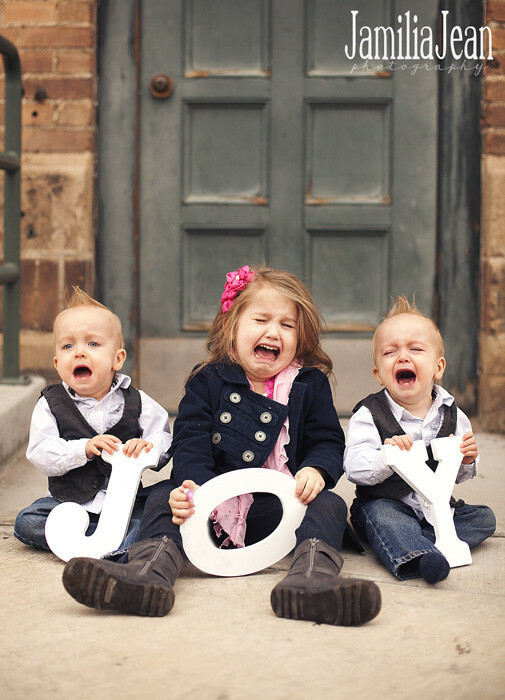 I love this image because it reminds us of how during the holidays we are often called to emote joy even when we are feeling something different. We are supposed to appear merry and jolly even when we’re not. People say things like, “Don’t be sad. It’s Christmas!” So we plaster on a smile at the family gathering or office Christmas party, and pretend to be joyful, even when we might be filled with tears. It is for this reason that we feel the need to hold our Blue Christmas service each year, giving people permission and a place to feel sadness, grief, loneliness, and everything else we go though even during Christmas. This is not the joy Isaiah is encouraging. It is not a “Don’t worry. Be happy.” or “put on a happy face,” mindset. He is not asking people to simply smile and get on with it or over it. Instead, he is reminds the people of Israel of God’s presence, which is the source of true joy. This is the message of Christmas. Christmas is not so much about making us merry, as it is about knowing that God is with us even when things are messy, even when our life is in ruins. The work of Christmas is not something we slap a smile on our face to do. Rather, we undertake the work because we know Emmanuel – God with us, in the stable, in the mess, even in the ruins. Back in October, I had the privilege of leading a group of our youth on a one-day mission experience in Loveland, Colorado. We went there to assist Group Publishing – the people who write our Sunday School curricula, lead our summer youth mission trips, and happen to be headquartered in Loveland – with cleanup efforts they had organized for their neighbors. 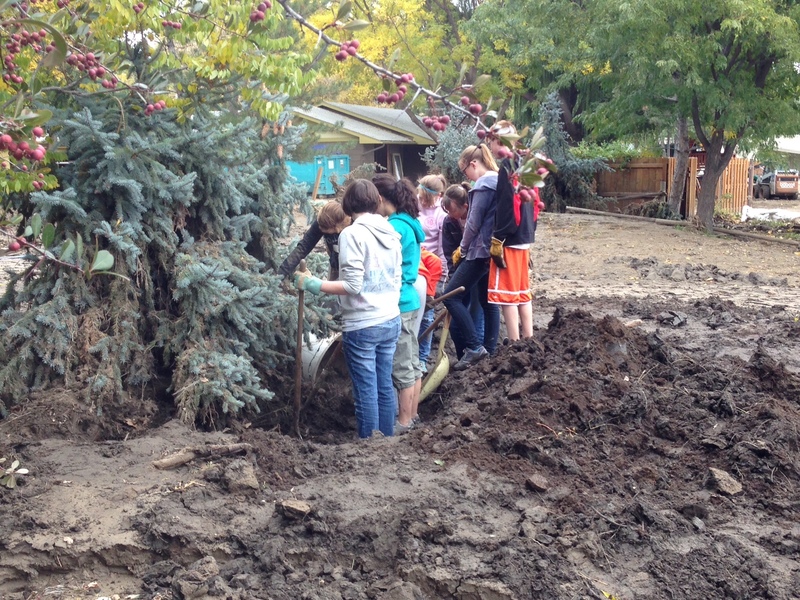 Our youth were assigned to work with a family who owned a landscaping company, whose home was on the same property. When we arrived, we were surprised to find that when the floodwaters receded they left behind a 3-foot deep layer of mud over the entirety of the property, and even inside the house. 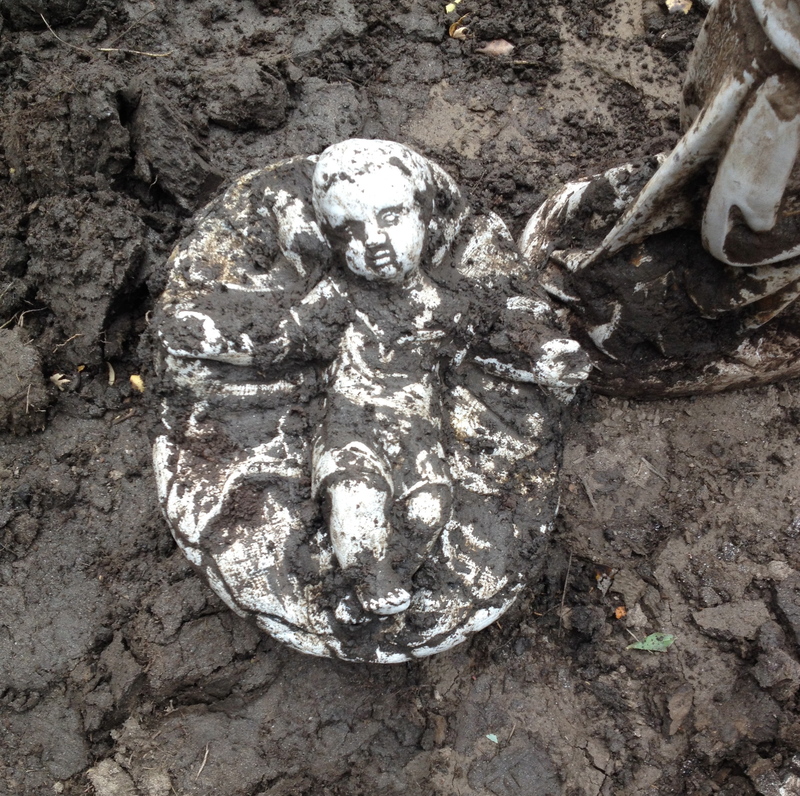 We were tasked with removing mud from around the trunks of trees that were being choked by it, and to dig out a concrete patio set and nativity which had been on display in the yard when the waters rose. As you can imagine, the mud was heavy, making the work very difficult as well as quite messy. But we went to work moving the mud. 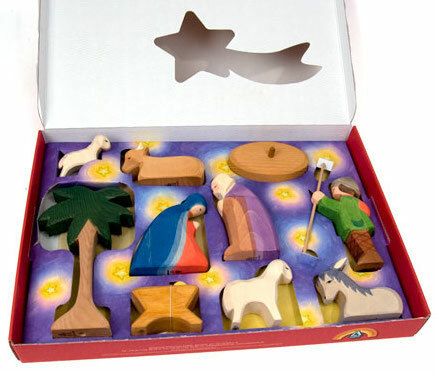 We dug slowly around the nativity – removing from the mud the cement figurines of a camel, shepherds and sheep, the wise men, and even Mary and Joseph. Then, eventually, we came upon this. There buried in the mud and muck was the figurine of the baby Jesus lying the manger. It took us a while to find him, but he had been there all along. There in the cold, wet muck that had covered the community and had taken so much from them, was the symbol of joy, real joy, Christmas joy. Somehow seeing the manger caked in mud made it even more powerful. Jesus hadn’t abandoned Loveland, or Black Forest, or my friend in her doubts, or you, or me. He has been there all along. This is the Christmas we need to celebrate all year. As 2014 dawns upon us, let us resolve not to store Christmas away, but celebrate the joy of Christmas, Emmanuel, God with us by serving those in need around us. In other words, let’s get the joy, and get to work. A very heart-felt sermon. Thank you so much!